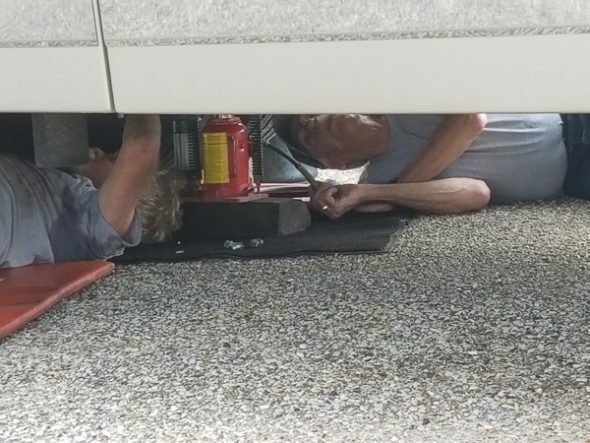 Thank God Storm’s a Mechanic! If you have followed Storm and I from the start of our adventure, you know about the entertainment that our auto-leveling system provides us. We kinda love that we can level the coach with our airbags and not put any jacks on pavement when we stop at paved parking lots overnight but this convenience has a downside. 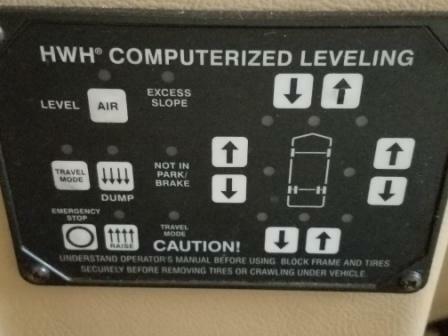 When the system determines that we are not level, it releases a shriek of blast dump air from the bottom of the coach and a compressor loudly pumps the airbags back up to level often startling me awake in the middle of the night. Although it sometimes seems that it releases air only to add the same air right back in, Storm maintains that I am too sensitive to the sometimes inexplicable behaviors of this system. In order to keep peace, we reach a compromise that involves using the auto-leveling system when we are parked in places like this refuge where the wind is usually so loud a train could run through the park and no one would hear it. In parks like Bull Creek where the silence at night is so pure that we hear owls hooting in the trees near our windows, we turn off the system. A week ago on a rare calm evening in the dead of the night, I realize the compressor on the leveling system is running almost continuously. Although we both sense a developing problem, we are not willing to deal with this in the dark and groggily agree to check it out in the morning. 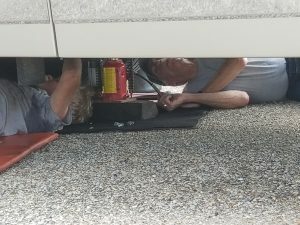 Morning arrives and we decide to level the coach again from scratch (put it in travel mode, dump all air and re-level) in hopes a re-level will repair whatever is making the compressor run. When Storm starts the coach engine and walks around outside to check for strange noises, drips, etc. he hears the unwanted steady whoooosh of escaping air. He also notices that the coach rear is leaning to the left and is not raising up off the wheels to travel mode. OK – we have a problem. With the enthusiasm of a condemned convict approaching the gallows, Storm slides over the rocky platform under our coach to search for the air leak. After a litany of unrepeatable language that I now understand is required for any type of serious maintenance or repair, Storm returns from the dark underbelly of the coach to report that one of our suspension airbags has a hole in it. Apparently a fitting near the bag has been slowly wearing through it and last night it managed to complete the job. We resign ourselves to being out of level for a week or so while we work to remedy this latest fiasco. When we call Coach-Net (our emergency roadside assistance folks), they begin the search for a nearby mechanic who can come out to us for service. Storm starts working the phones and combing the web to find the correct suspension replacement bag. 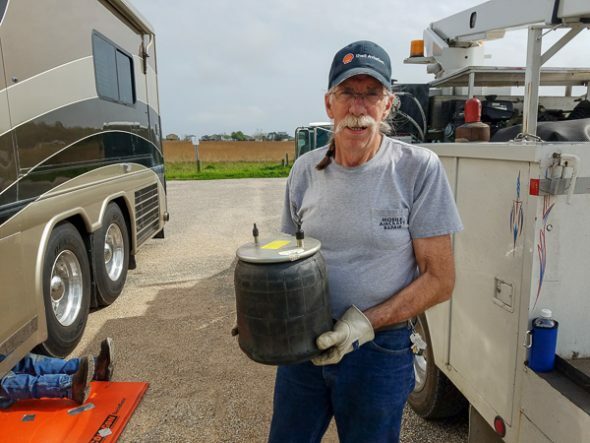 Coach-Net agrees with Storm that moving the RV with a partially operable air bag is asking for trouble so they will pay the on-site service fee to send a mechanic to us. After a few more expletive filled explorations crawling through the gravel under the coach to find a model number for the airbag and after finally receiving a return call from Country Coach, Storm believes he has the correct info to order our replacement. A week later, with replacement part in hand and service truck on site, the repair begins. Rick arrives alone to help us, but work will proceed more quickly if Storm assists him. 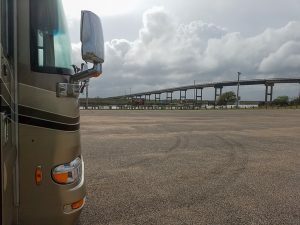 Fortunately Storm is able to move the coach a short distance to a “paved” lot that was slightly less rocky than our park RV pad. Work proceeds with a duet of curses against the road, the manufacturer, and the general non-cooperation of all things mechanical. As I shelter in the quiet breeze of the driver’s seat ready to assist if called upon, I am relieved that Storm could both collaborate with Rick and keep on eye on proceedings below as some of the hammering emanating from down there sounds more destructive than constructive. Storm thinks it odd that the coach was designed so that the bag could be pierced by a nearby fitting, but after fastening the replacement in place it becomes clear that the old bag had sagged outward (much like myself) and began rubbing the fitting on its own. Rick agrees with Storm that just to be safe, they should relocate both side fittings as the one on the right is beginning to rub that bag also. Four hours later we are able to level again. At a total cost of $600, this was a mildly costly inconvenience and we are very lucky that we discover it before we get on the road. We are both optimistic that by repairing this air leak which we believe may have been slowly growing over the last few months, the whole system may begin to behave more pleasantly. A girl’s gotta dream you know! I am sorry that it gave you so much trouble. Hopefully it will be simpler from now on!